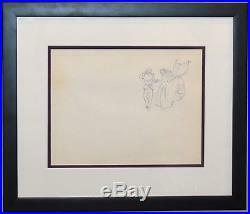 Original Walt Disney Production Drawing featuring Cinderella and Prince Charming. Studio: Walt Disney Medium: Production Drawing. Characters: Cinderella and Prince Charming Year: 1950. Edition: One of a kind. Size: 21" x 18" framed. A certificate of authenticity guaranteeing the authenticity of this artwork for life will be issued by Georgetown Frame Shoppe. It may contain scratches, dents, scuffs, fading, and other imperfections. 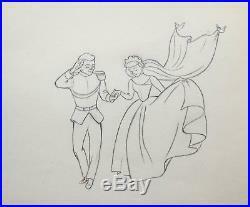 The item "Original Disney Production Drawing Cinderella ft.
Cinderella, Prince Charming" is in sale since Wednesday, August 15, 2018. This item is in the category "Collectibles\Animation Art & Characters\Animation Art\Limited Editions".